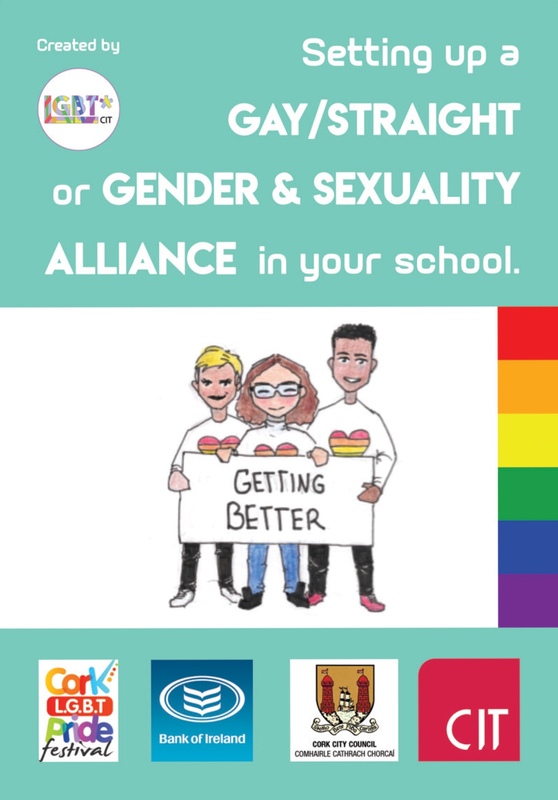 Cork Institute of Technology LGBT* Society will launch Ireland’s first instructional handbook on how to set up Gay/Straight Alliances or Gender & Sexuality Alliances in secondary schools. The handbook will be launched to students and staff of Cork secondary schools by Lord Mayor Mick Finn on Wednesday 20th of March in Corks Millennium Hall. The handbook, sponsored by Cork Pride Festival, Bank of Ireland, Cork City Council and Cork Institute of Technology aims to provide schools with the information they need about how to set up and maintain a GSA in their schools. The initiative has also received support and input from UP Cork LGBT Youth Project, Gay Project Cork, LINC, LGBT Ireland, BeLong To LGBT Youth Services, Cork LGBT Interagency Group, Union of Students Ireland, and CITSU among others. Invites have been sent out to 91 secondary schools in Cork city and county. The launch will feature talks and information stands from local LGBT+ organisations as well as speakers from supporting schools such as Príomhoide Tadhg Ó Leighin from Coláiste Daibhéid who said “This is important work for a vulnerable section of every school community. Inclusivity and support for all our students in Coláiste Daibhéid is a central part of what we strive for”. Principal Kevin Barry of Deerpark CBS who has also supported the project from the beginning said “As Principal of Deerpark CBS, I am also delighted to support this worthy initiative. Deerpark is a Catholic co-educational secondary school in the Edmund Rice tradition. It was the first school in Cork to raise the rainbow flag in support of LGBT* staff and students. As Principal of this wonderful school community, I strongly believe that the more we can all do to help break down the barriers of ignorance, exclusion and intolerance through projects like this, then the better for all young people, not just LGBT* young people”. The Chairperson of CIT LGBT* Society Konrad Im said “This is a project we have been working on over the last number of months that was inspired by the experiences of our society members and the members of UP Cork LGBT Youth Project. Young people had expressed to us that they were seeking such supports from their secondary schools but there was a lack of information in an Irish context of how to go about and maintain such a group. We’re delighted to be able to help provide this information and are overwhelmed with the support we’ve received in the process. It is our hope that this project will help the vulnerable young people that we’ve seen come through our society over the years and those that we’ll see in the future”.